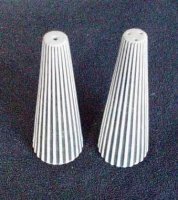 Standing at a splendid 13 cm and dating we guess from the ‘50s or '60s these salt ‘n pepper holders are both elegant and tactile. Don’t expect them to look new – they don’t - and one of the plugs in the bottom has a bite out of it. But ooooooooh won’t you just love fondling those raised white ribs.